Nothing say Fall more than cozy sweaters, cool crisp air, the changing of colors, and sunflowers. Yup, Sunflowers. Now, sunflowers are great for Summer weddings too, but there is just something so perfect about sunflowers in the Fall. Maybe it’s because their bright yellow petals and deep brown centers blend beautifully with the rich colors of the season or maybe it’s because they remind us of the sun and we are still trying to hang on to every last ounce of sunshine before the winter comes… whatever it is, there’s no denying that sunflowers are fit for Fall. 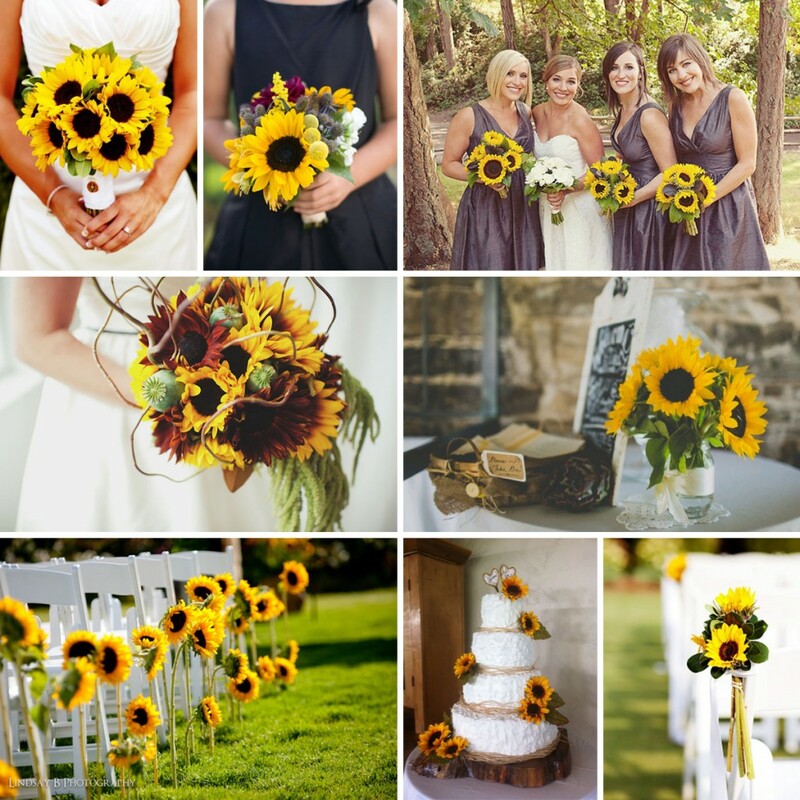 Sunflowers can be used alone or combined with just about any other flowers and greens. For a Fall look, try combining with other Fall favorites such as Dahlias, Craspedia Billy Balls, Solidago or Hanging Amaranthus. To see how FiftyFlowers Brides have used their wholesale sunflowers from FiftyFlowers.com, click here. Open your box of flowers and inspect. If upon first inspection, you foresee a problem with your flowers, call us immediately at 1-877-507-6737. However, it is absolutely NORMAL for your flowers to appear sleepy and thirsty after their journey. Remove any plastic or paper packaging from each bunch of flowers. Your sunflowers may come with netting around each individual bloom, you can leave these on for the first 4-12 hours while hydrating, but then remove to let them bloom open. Cut stems diagonally under running water with sharp scissors about 1-2 inches from the bottom of the stem. Tip: Sunflowers may not have perfectly straight stems. Please take this into account when arranging your bulk flowers. Also, Sunflowers are phototropic, meaning that their heads follow the light. Place a light directly over the sunflowers while they hydrate to help them open upward. Once arranged, make sure the arrangement is evenly lit to prevent shifting. If your Sunflowers still are not opening after 24 hours in water, please contact our flower experts at 1-877-507-6737, and they will give you some added tips on caring for your Sunflowers.